Welcome. Thank you for stopping by for a visit. I've designed this web site to showcase the wonderful waterways around this fair city. Stay tuned to this page for news of the many events to grace our waterfront. Events like the Perch Festival, Christmas in June, The Giant In-water Used Boat Show, the Centre of Power Poker Run, the Centre of Power Boat & Cottage Show and much more. But you don't have to wait for one of these events as a reason to visit us. Any time is good. Ok.....so what are you waiting for? Scroll down and get on with it! You won't be sorry. Many people that I've met, both on and off the net, don't know where Orillia is. It's about 140 kilometers/ 85 miles north of Toronto in the heart of Ontario's cottage country. The population is just over 27,000. 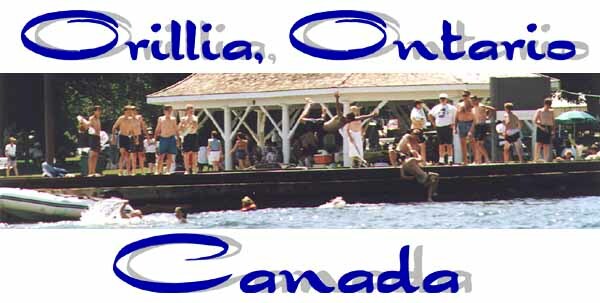 Orillia is in a wonderful location which puts it on the shores of Lakes Simcoe and Couchiching. Lake Simcoe, is approximately 30.6 km/19 miles long and 16 miles/25.8 km wide for a grand total of around 840 sq km/325 sq. miles. It has been referred to, at times, as "The forgotten Great Lake". Lake Couchiching, is a smaller lake in size of about 16 km/10 miles in length and 4.8 km/3 miles wide. They are joined by "The Narrows", a waterway about 1.2 km/.75 mile in length. The Narrows is the location of the majority of marinas in the immediate area. Together they are a part of the 386 km/240 mile Trent-Severn Waterway. Drivers to the area will be happy to know that driving over The Narrows is much easier. The twinning of of the Atherley bridge over The Narrows is now complete. The Trent-Severn Waterway starts at the Bay of Quinte on Lake Ontario. The waterway then wanders through central Ontario and ends up at Georgian Bay. Recreational vessels from around North America can be found touring through the area. The vessel with the farthest home port from Orillia, that I personally saw, was from San Francisco, California. Including the Port of Orillia, there are about 11 marinas (by my count) in which to gas up. pump out and stretch your legs. The Port of Orillia has 222 full service slips available. It's located right at the foot of the main street. So you're close to shopping for anything you need. It even offers a free shuttle bus to Casino Rama. Next to the Port of Orillia is Couchiching Beach Park. It offers a beautiful sand beach in which to cool off at. Wide open areas and comfortable shady spots are plentiful. Recently our beloved Rotary Club mini steam train that gave kids, and any one who wanted to be a kid, a pleasant ride through the park was sold. Increasing costs and changes in government regulations made it impossible to continue to operate. It was sold to the company that manufactured it about a century ago. I do hope some kind of replacement ride is found. A ride on that little steam train is one of my early memories of Orillia. Just a note of caution. If you decide to venture out onto the water, I would give the lakes and weather a lot of respect. There are numerous days of sunny and calm weather in which to enjoy. It's those other days you have to be on guard. Lake Simcoe, because of it's size, can get quite ugly at times. Lake Couchiching, although smaller, does demand the same respect as Lake Simcoe. 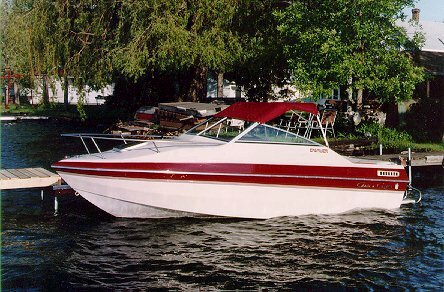 Once I had a wave break over the bow of my boat on Lake Simcoe, as I watched the Orillia Power Boat Poker Run. I'm not trying to scare anyone. I'm just emphasizing that you shouldn't leave your brain in the car when heading out. Take it out on the lake with you. Decorated boat contest & illuminated boat parade, turkey buffet dinner with proceeds to local charity. Celebrate Canada Day with us in Orillia. See the parade through Downtown Orillia and the waterfront, have some community birthday cake, entertainment on 3 stages with fireworks at dusk at Couchiching Beach Park. With Orillia being on the shores of 2 lakes, there's plenty of lakefront property within the city limits. Also there are 4 canals in Orillia that offer waterfront location in a residential setting. If you're not into city living, there is plenty of lakefront property just minutes from Orillia. Maybe you're looking for a summer getaway. Buy a cottage on one of the four islands nearby. With Grape Island on Lake Simcoe and Horseshoe, Heron and Garnet Islands on Lake Couchiching you should be able to find something to your liking. That is, if anyone is silly enough to sell. Ok, so maybe your idea of a getaway is camping instead. Well, we got that too. You can choose from three provincial parks in which to escape from the big city. Mara and McRae Point Provincial Parks are located just east of Orillia on Lake Simcoe. Bass Lake Provincial Park is located on a small lake just west of Orillia. Between the three parks there are almost 500 campsites available within minutes of the city. It's highly recommended that you reserve a spot ahead of time. They are all popular destinations and fill up almost every weekend. Summer is a great time to be here. I take full advantage of it. At every opportunity, you will find me either next to, on or in the water. I have a boat and enjoy traveling around the waterways and islands. You've read about the boating and stuff. Now take a look at what I was talking about. Some of the images were taken in the summer of '96 with a friends' digital camera by me. The rest were taken & scanned by me in 1997. © 1997,1998,1999 - The pictures in the Photo Gallery were taken by me. So you don't have permission to steal them. If you want to use a photo, just ask. I'll probably say yes. You are visitor number to grace this page with your presence.